If there is in society a collective consciousness, then art is its imagination. Imagination is different from fantasy, which conjures up desires divorced from reality; imagination is creative problem solving that assesses what is available and re-creates it into something new, better, or self-satisfying. Detroit has been short on many things over the past fifty years — economic prosperity, functioning city services, racial justice, validation — but it is astonishingly long on imagination and creative problem solving. People who truly know artists know that they are all problem solvers at heart; they just have different problems. The talent of Detroit lies in plain sight, if only you demonstrate interest, generosity of spirit, and patience. Here, then, are some field notes and observations from seven years of study within the Detroit art scene, highlighting our strengths, our surprising customs, and the needs that threaten the health and sovereignty of this thriving environment. For some, Detroit is an easy place to love; for others, it is a launch pad; for many, it is an anchor — perhaps offering ballast and stability but also entrenchment. In recent years, Detroit has become something of a hot destination for reasons that include the trend of disaster tourism, the accessibility and potential of affordable living and work spaces, and the lively profusion of long-hoped-for new growth and culture, generally understood as the comeback narrative. Each of these carries a set of embedded contradictions because, as even a short time in Detroit will reveal to the observant visitor, it is a place of simultaneous truth, where the stories you find form only one part of a complicated picture. Disaster tourism comes in part because some of the easiest things to notice about the city are ruin, decay, and dissolution — assuming you wander or are led anywhere outside the city center and isolated pockets that are enjoying the bulk of investment and redevelopment. When the outside world comes to gawk at the high-visibility trappings of a city ravaged by decades of racism, industrial decline, and corrupt politics, there is a sense that it is to reassure themselves that this could never happen closer to home (spoiler alert: it can). The question on everyone’s mind when they encounter Detroit’s sprawling infrastructural collapse is, What happened here? The shortest answer is rooted in the unsustainability of mono-industrialism, unchecked consumerism, and rampant growth. The more complicated answer is that just as Detroit built automobiles, it also built labor systems around institutionalized racism. This year, our city collectively commemorates the fiftieth anniversary of the 1967 civil uprising, which remains at the center of unresolved trauma in the region, and thus I will leave the detailed history lesson to better historians: the Detroit Historical Museum; the Charles H. Wright Museum of African American History; lifelong Detroiter, writer, and documentarian Marsha Music (her piece “The Kidnapped Children of Detroit” is included in this Reader), and eccentric observer and curator Sherry Hendrick of Alley Culture. As for the comeback story, in case you haven’t heard, Detroit is on the comeback — built on the efforts of a few influential billionaires and philanthropic organizations. But again, many things are true at the same time, and those champions of the comeback narrative conveniently overlook the racial and demographic disparities plaguing an old-school model of city redevelopment that concentrates wealth in a few, conveniently and disproportionately white neighborhoods in and around city center — not to mention the very real challenges of coping with egalitarian distribution of resources over a massive cityscape. As we know, author and activist Jane Jacobs once said of the city, “Detroit is largely composed, today, of seemingly endless square miles of low-density failure” — 143 square miles, to be precise. Much of this “comeback” is taking place within the same 5 square miles that have historically seen the bulk of preservation and redevelopment efforts. The thing that is rarely acknowledged about Detroit is that even in the worst of times, people have been there. Though admittedly low-density — even in its heyday, residents preferred single- and double-family homes to mixed-use high-rise development — the city was never a blank canvas (which is, in itself, an idea rooted in a long and egregious history of colonialism), any more than a field of wildflowers somehow lacks life and biodiversity. What has fallen apart over the past half century is infrastructure — a daunting reality that is currently facing the United States at large — but in its place has risen a tenacious and self-sufficient populace. Detroiters work hard and have held together what they can of this city through decades of neglect. Those who look at the current state of Detroit and see failure are missing the odds of it existing at all. This idea of hard-working Detroiters, coming directly out of the third-shift mentality that kept the auto factories running around the clock, has spawned its own genre of trite associations (“Detroit Hustles Harder”), which may generally minimize the tenacity and strength of the core Detroit populace, largely drawn to the city during the Great Migration, which siphoned some of the post-Reconstruction agricultural labor force out of the emancipated South. For an alternative to popular ideas about the forces that motivated blacks to leave their homes in the South, one might do well to speak with Malik Yakini of D-Town Farms, Tepfirah Rushdan of Keep Growing Detroit, or Baba Wayne and Myrtle Curtis of Feedom Freedom — just a few among many others within Detroit’s urban agricultural community who experience abundance and struggle in their ongoing fight for food justice and sovereignty. 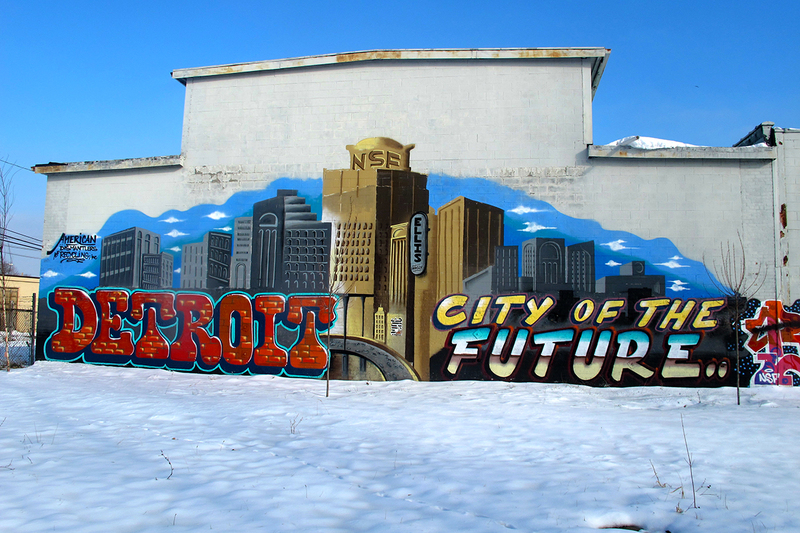 An Eastside Detroit mural by the nationally renowned Non-Stop Fam graffiti crew. Finally, we come to the alluring living and work spaces of a type that are simply out of reach for most denizens of the capital cities like New York, Los Angeles, and San Francisco. Here is where we find the conditions appealing to artists, and one of the factors that continues to build a thriving art community within the city. But unlike art in other places, the Detroit art biosphere is decentralized and takes place within a thousand little hidey-holes. It may be useful to employ the metaphor of the coral reef. If a diver — in this case, a newcomer or visitor to the scene — splashes down into this environment, it may take some time for Detroiters to emerge from their nooks and crannies. You must sit patiently, let folks get acclimated to your presence, and sink in over time. Ideally and eventually, those with sincere interest become welcome visitors to Detroit spaces — suddenly, there appears an ecosystem teeming with life! In fact, it is in dealing with space and the intersection of art and daily life that Detroit stands out in pushing the global conversation about where art belongs, what function it serves, and to whom it belongs. Much like the Cass Corridor movement of the 1970s, which featured a diverse and diffuse population of sculptors, muralists, painters, poets, and musicians that broke out of the city through the efforts of influential curator Sam Wagstaff, the real Detroit art movement is happening at the lunatic fringe, in houses, in reclaimed ex-industrial spaces, and in homegrown festivals and is always in motion. Detroit has a preponderance of human resources: makers, fabricators, and creatives with practical skill sets and fluency with industrial processes. There are the stalwarts of the Cass Corridor art scene, a virtually apolitical art movement that emerged in the wake of the polarizing 1967 rebellion and salvaged both materials and community from the shocked post-rebellion landscape. Cass Corridor artists were also known for their pushback against the prevailing convention of abstraction that held the wider art world in its grip. A number of these artists maintain thriving creative prac-tices, like Robert Sestok and Nancy Mitchnick (in public sculpture and large-scale figurative painting, respectively). There are also contemporary and conceptual interventionists like Scott Hocking and Jon Brumit, and a preponderance of interdisciplinary fiber artists like Corrie Baldauf and Jeanne Bieri — all of whom pour countless hours of labor into the creation of single works. This directly impacts the type of art that is made and also provides a common language between “art types” and “non-art types,” who may not always appreciate nonformal aspects of art making but can nonetheless identify with and appreciate labor and care in making. Whether they make art of place or not, Detroit artists have the capacity to work at a fantastic scale, taking advantage of readily available spaces. The commonplace nature of many of these found materials offers points of entry for people who may not otherwise engage with art. There is also a long-standing tradition of using structures like houses as actual art materials — a kind of “house-art” tradition established in the 1960s, continued by Tyree Guyton on Heidelberg Street and Olayami Dabls at the MBAD African Bead Museum, and carried by a new generation of house artists, including Mitch Cope and Gina Reichert of Power House Productions, and Graem Whyte and Faina Lerman of Popps Packing. These are standout examples of house artists who have created public-facing extensions of their personal practice spaces, but in truth there are dozens of studios, fledgling compounds, live-work spaces, mixed-use art and agriculture concerns, and Frankensteinart houses all over the city. The mainstream art market has well and truly digested art objects at this point, but it has not yet found a way to completely own or invade art of place. Though many here struggle to remain free — especially as the redevelopment engine encroaches upon and reclaims spaces that have been freely maintained by individuals, sometimes for decades — the spaces held by artists can still represent sovereign territory. Free space is an absolute necessity for art to provide meaningful pushback to society, as well as progress. Self-determination is the silver lining to the fact that there has been very little help or centralized infrastructure in Detroit for many decades. For long years, if you wanted something, you had to head across 8 Mile (the dividing line between Detroit proper and the metro suburbs to the north), or you had to build it yourself. In some ways, Detroiters are better at do-it-yourself than anyone, and many of the legacy gallery spaces, residencies, and art destinations in the city are self-made. But that is not to say they come from nothing. If you were to dust the Detroit art world for fingerprints, you would find those of Yvette Rock of Live Coal Gallery on dozens of artists — just as you would have found Gilda Snowden’s before her. The independent gallery Young World, operating seasonally out of a warehouse space devoid of all but the most bare-bones amenities, proves that world-class art is rooted in ideas and execution, not context of place. O.N.E. Mile in the North End is a living demonstration of the power of open-source, community-led design as a tool for intervention and collaboration. Complex Movements, on the upper east side, is doing some of the most successful and complicated social practice work to be found anywhere in the nation, creating interactive performance modules that invite audiences to physically engage in communication exercises as praxis for collective decision making. Nonetheless, though art based in social practice is gaining recognition, the art world still tends to champion the “lone genius” concept, one that is demonstrably false upon closer examination and one that disproportionately favors modes of working enjoyed mostly by men. The Detroit art scene has many strong women of color who devote a significant portion of their resources and energy into facilitation, which produces results but outcomes less identifiable than discreet art objects or performances. Dancer and choreographer Ryan Myers-Johnson finds less time for her personal practice, busy as she is in continuing to grow her radically popular annual Sidewalk Festival of Performing Arts. Gallerist Simone DeSousa has fewer resources to devote to her experimental painting work because a huge portion of her energy is poured into one of the most experimental and longer-running galleries in the Cass Corridor (all the way through its current rebranding as Midtown). Detroit has a number of grants that reward the efforts of individual programs and practitioners, but as this city is organically independent and has a decentralized infrastructure, it is long overdue for a grant that rewards social practice artists, particularly those who make possible the work of others. Additionally, on a broader scale, the city seems willfully oblivious at times to the fact that the current wave of new commercial development is built directly upon the shoulders of the largely unpaid work of its art community, who are among the early victims of unstable living conditions and gentrification. We are long overdue to formalize the relationship between artists and city planners through the re-creation of a Detroit Arts Council as a funded and official part of the city government, an idea championed by mayoral candidate Ingrid LaFleur and many other members of the Detroit Cultural Council. Many cities underwrite such a council through small-percentage taxes on hotels and other new developments, and Detroit is in a prime phase to facilitate such direction of resources at the moment. Detroit’s glory, which peaked midcentury, was built through manufacturing; as a result, longtime Detroiters can be out of step with the array of professional skills necessary to promote a contemporary art practice. A particularly lethal combination of midwestern humility and lack of external validation has disadvantaged many Detroit artists when it comes to talking about their own work. Most of the country’s major art centers are ruthlessly competitive, and Detroit’s “get along to get along” approach is, at once, profoundly generative and something of a handicap in the wider world. Working tirelessly on this and other issues of inequity — such as that an estimated 40 percent of city residents are without Internet services, and that many native residents are retrograde about having a web presence — are a number of social justice entities. Detroit’s failure of public infrastructure has seeded the field for private enterprise. Sometimes this looks like the complete takeover of the downtown area by Quicken Loans magnate Dan Gilbert and his Bedrock development corporation, but sometimes it looks like the scrappy, homegrown efforts of the Boggs School, a community elementary school named for Detroit activist and icon Grace Lee Boggs. Allied Media Projects draws activists and social justice professionals from all over the country for its annual Allied Media Conference, and also acts as a fiduciary for smaller grant-seeking entities that fall within its mission parameters. Creative Many Michigan not only offers a battery of professional skills development resources directly to artists but compiles data regarding the economic impact of creative professionals on a regional and statewide level, putting hard numbers to the sometimes intangible benefits of creative sector labor. For anyone interested in the hard numbers of creative practice in Detroit and greater Michigan, Creative Many is a key source of information. Like many grantmaking organizations, Creative Many promotes and encourages the recognition of artists as professionals — and there are certainly some benefits to that model — but it bears acknowledging that the high premium placed on professionalization, especially for lone artists, can be nearsighted and problematic. This constant pressure and prioritization for projects that follow a model recognizable to grantmakers may force artists into configurations that might not serve them long term. Grantmakers need to acknowledge that it is not preferable for everyone to become a nonprofit, and Detroit is used to lean running that often does not include salaries for anyone, let alone a full-time fundraiser. Current models for grantmaking often require adding additional administrative help (and thus overhead), while still really being interested only in paying for programming. If you want to build entire organizations, you need to fund entire organizations, not require artists to build an entire organization in order to receive a grant for a single project. Art grants exist because we agree that there is deep validity to the cultural and creative output of artists. Adding a degree of openness to outcomes builds the potential for artistic process, which is often by nature exploratory — how could anything truly interesting or innovative fail to contain surprises? There is much to be gained by providing artists with less restricted funds to build their practice and trusting them to use that funding in ways that benefit not only themselves but their entire network and the art ecosystem in general. Detroit artists, more than anything, have proven that making art and intervening in their surrounding spaces are crucially important, constantly investing their limited means and indefatigable spirit to make projects a reality with relatively little institutional support (though more than other regional markets). It is reasonable to imagine that given more direct investment, they will make more and better art. Sarah Rose Sharp is a Detroit-based writer, activist, photographer, and multimedia artist. She writes about art and culture, online and in print, for Art in America, Hyperallergic, The Believer, Sculpture Magazine, Art OnCuba, Flash Art, ArtSlant, and others. She was named a 2015 Kresge Literary Arts Fellow for Arts Criticism and was selected as a participant in the 2015 Art Writing Workshop facilitated by AICA/USA and the Art Writers Grant Program. She has shown work in New York, Seattle, and Detroit — including participation in the 2014 Ofrenda group show at the Detroit Institute of Arts — and in solo shows at Public Pool in November 2016 and at Simone DeSousa Gallery in January 2017. She is primarily concerned with artist and viewer experiences of making and engaging with art, and conducts ongoing research in the state of contemporary art in redeveloping cities, including a process blog called Breakfast with the Artist.